Iconic costume will be up for grabs Nov 9-10 in Los Angeles. 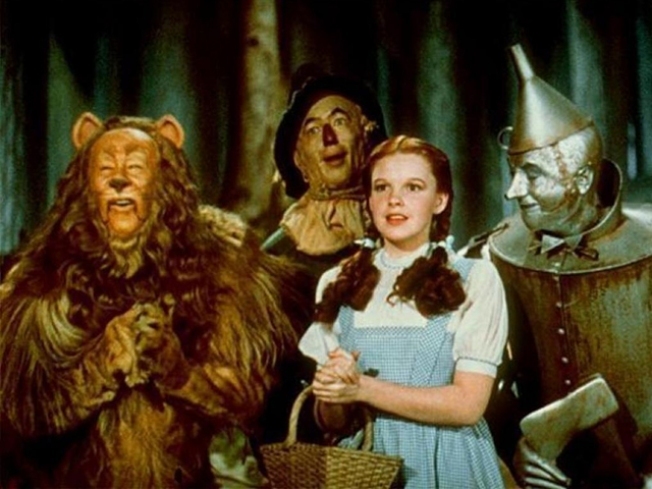 The costume Judy Garland wore as Dorothy in the film "The Wizard of Oz," seen in this photo from the movie, will go up for auction in Los Angeles on Nov 9-10. The Dorothy dress is going up for auction. Celebrity auctioneer Darren Julien says Judy Garland's original costume from "The Wizard of Oz" could sell for half a million dollars when it hits the auction block next month. The outfit will be on view at London's Stafford Hotel beginning Tuesday, before being exhibited at Julien's Auctions in Beverly Hills, Calif., Nov. 5-9, prior to the auction Nov. 9-10. News of the sale comes on the heels of the announcement that the Smithsonian Museum will loan a pair of Dorothy's ruby slippers featured in the film to London's Victoria and Albert Museum. The shoes will form part of the exhibition "Hollywood Costume," which opens on Oct. 20.